The swing also has soft seat pads and removable infant head support so your baby will never be uncomfortable. The two Mix N’ Move toys are great stimulation while the variable speed lets you decide how slow or fast your baby will be rocked. Save yourself from the hassle of bringing your own swing or just try it out! 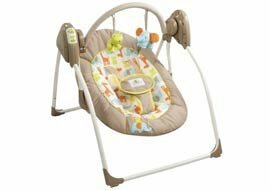 Add on some more baby items from our variety of supplies to make it over $25 for free delivery.